Here is a very helpful newsletter by Heidi-Jane Humphries about sport and diabetes. The interaction between exercise and insulin with the insulin dependent diabetic is an ongoing fascination for me, there is much to learn and there is constant development, so I appreciate the questions you ask. First of all, what I have to say should not be taken as medical advice. Please discuss any changes you are thinking of making to your diet, exercise and insulin regimes with your doctor first and heed his or her advice. 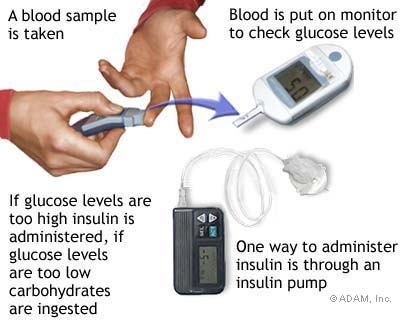 First of all, you need to ensure that your blood sugar is being monitored accurately and regularly. This means systematically taking readings several times a days and maintaining a diary record. You could go a step further and enter this data onto a computer spread sheet to produce various charts. A most useful function is to insert trend lines that indicate whether or not what you are doing is pushing you in the right direction with regards to optimum blood sugar levels. many athletes have opted for an insulin pump. With the technology improving almost by the month, this is a worthwhile option for the steady delivery of insulin throughout the day. Exercise is very healthy for you and it should assist you with managing the condition. As your fitness improves, you may find that your body needs less total external insulin and you need fewer carbohydrates to maintain optimum blood sugar levels throughout the day and your total requirements for insulin will be less. Experiment with the time of day you exercise. Some diabetic athletes have found exercising during the early morning is best when blood sugar levels may be quite high. With regular monitoring of blood sugar levels and subjectively gauging how you feel, you should be able to work out the time of day that best suits you to do most of your exercise and how to adjust your insulin needs. Have a set routine of exercise and diet from one day to the next with regards to diet and exercise. If your exercise is all over the place from one day to the next you may have difficulty maintaining blood sugar stability. When doing a long ride, it is important to maintain optimum blood sugar levels, so it makes sense to have some carbohydrates coming into the blood from the gut. Each diabetic person is different and factors such as the intensity and duration of the ride and your base fitness complicate matters, so it would be foolish of me to give firm advice on what to eat and drink and how much. However; I would suggest some experimenting on a few rides, taking blood sugar readings as you go and monitoring how you feel in terms of energy levels and general well-being. With regards to diet, I recommend that you give strong preference for quality carbohydrates from sources like whole grains and crops like taro, potato, bread fruit, kumara and pumpkin. Avoid refined carbohydrates like white bread, sugar, white rice and pasta. Keep the refined sugars in reserve for a quick blood sugar fix if you need one and use the more nutrient rich slow release carbohydrate sources, like taro, as your main source. Experiment with a rich source of protein and healthy fats with each meal. For example; you could try having a couple of desert spoons of low fat cottage cheese with flax oil mixed in ten minutes prior to meals and snacks. You could also try incorporating a nutrient packed whey protein Super Smoothie before and after training rides. The Super Smoothie recipe is in the Recipes Section of www.GaryMoller.com. A diabetic should ensure that her diet is rich in antioxidants because it is free radical damage that is the cause of many of the long-term health problems associated with diabetes. The Super Smoothie, with its dark berries and raw free range egg yolk is a great source of antioxidants and the fat soluble vitamins. You could add extra vitamin C and E to this.